Zadara Storage was recently voted by IT pros as the brand leader in the emerging market for on premise enterprise storage as a service (OPaaS). Validating the importance of OPaaS, Microsoft yesterday announced an on premise offering for Azure. Zadara, Microsoft and OPaaS represent an innovative new way to acquire capital equipment which is like leasing, only better. Download the report version of this article. In 2006, Amazon introduced S3 and the storage-as-a-service category, launching a whole new era of cloud computing. A decade later, the enterprise infrastructure market almost completely bifurcated into traditional on premise enterprise infrastructure and off-premise public cloud computing. However, in 2011 Zadara Storage came onto the scene and blended the best of both worlds to create a third category: on-premise-as-a-service (OPaaS). With this model applied to enterprise storage, IT organizations keep their precious data on-premise, but pay only for the storage capacity they consume. Almost all IT organizations will eventually migrate to some form of enterprise storage-as-a-service. IT Brand Pulse forecasts spending on storage OpEx—including on-premise storage-as-a-service—to accelerate in the next few years. By 2020 OpEx will reach 50% of storage spending, and by 2023, 80% of storage spending will be OpEx. The critical importance of financing for large-ticket items such as cars for consumers, and equipment for businesses, is one key dynamic underscoring the mass migration from IT CapEx to IT OpEx. This year automakers will sell approximately 15 million vehicles. While the price of automobiles continues to increase, the total monthly payment (operating expense) has gone down. This lower monthly payment is a result of leases and longer financing terms. According to Experian, the average new car loan is 64 months and 27.5% of all new car purchases are leases, the highest level of leases since 2006. Companies acquire equipment needed to operate and grow. That’s why a majority of businesses consider equipment financing a key acquisition strategy. Each year American businesses, nonprofits and government agencies invest over $1.5 trillion in capital goods and software. Approximately 67%, or $1 trillion, is OpEx through loans, leases and other financial instruments. OPaaS is an example of an innovative new way to acquire IT which allow businesses to better mange their balance sheets, taxes and cash flow. 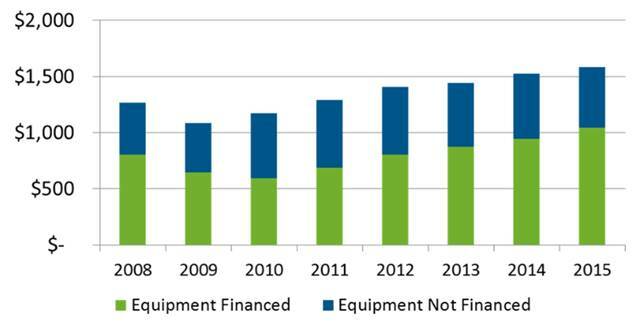 Source: 2015 State of the Equipment Finance Industry (SEFI), published by the Equipment Leasing & Finance Foundation. The SEFI is available atwww.leasefoundation.org. Like leasing, payments for OPaaS are spread out over time. But terms for acquiring OPaaS are better than leasing a car or enterprise storage array in two innovative ways. Leasing traditional enterprise storage requires customers to purchase headroom for growth. In other words, acquire unused capacity. The alternative is to store your data offsite in a public cloud where you can pay for only what you use. With OPaaS, IT organizations can keep their precious data on premise, but pay only for the storage capacity they consume. It’s like taking possession of the car, but paying only for the miles you drive. Another amazing characteristic of OPaaS is the ability to tune different parts of the storage environment for a variety of different workloads. It’s like taking possession of a high-capacity SUV, a high-performance sports car, and an economy car, all for the price of one. OPaaS is like taking possession of a Mercedes, but paying only for the miles you drive. Enterprise Storage-as-a-Service is like taking possession of multiple car models, but paying only for one car, and only for the miles you drive. 2. Amazon AWS does not want to go there…yet. They have a dominant position in Infrastructure-as-a-Service and they are working to take all computing off-premise. If Zadara and Microsoft are successful with OPaaS, like I think they will be, AWS may have to broaden their offering to include on premise services. 3. Few IT organizations, MSPs and channel partners know OPaaS even exists. Microsoft will help change that and validate the model. I am very bullish on OPaaS. The bottom line is IT organizations deeply appreciate the opportunity to gracefully migrate to a service model with a first step allowing them to keep the equipment and data on premise.